A City Of Assad Supporters In War-Ravaged Syria : Parallels In Syria, the port city of Tartous is fiercely loyal to President Bashar Assad. It's where many of his supporters, as well as Syrian soldiers, go for vacation. So far about 300,000 Syrians have also fled to the city looking for work and refuge from fighting in cities like Damascus and Qusair. The port city of Tartous is in a region loyal to President Bashar Assad. The city has been a refuge for supporters to vacation and seek work. Many people in Syria are accustomed to the sound of daily gunfire. It is normal in battle-scarred cities like Damascus or Qusair. 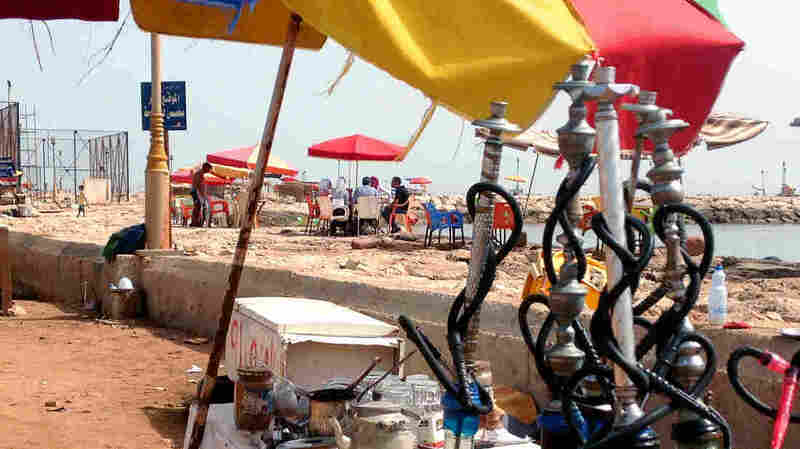 But along the beaches and in the cafes of Tartous, an area that is a center of support for the embattled President Bashar Assad, the sounds are a bit more peaceful. Near the water's edge of the Mediterranean, tables, chairs and umbrellas sit upon huge stones. At one of these tables sits a brother and sister on vacation. The brother, a 21-year-old Syrian soldier who didn't want to give his name, is given a few days off every few weeks. He doesn't talk about his duties, but says he has been under fire. Going from combat to the beach is a bit strange, he says. "Of course, I think about it," he says, "and it's hard to ignore that I could have been killed. But I believe in what I'm doing." His sister is a law student, though her studies have been delayed because her university is in the embattled city of Homs. Their father is a real estate developer. She says one thing Americans don't understand about Syria is the love and respect they have for the president and their country. Many, though not all, of Syria's elites have stayed loyal to the Assad regime, under which they prospered. And many people now rely on this Assad stronghold for more than vacation; many are displaced and looking for work as well. Around 300,000 Syrians have fled to the Tartous area. Some live in relatives' apartments, in converted schools and some stay in a government office building. At a main route into the center city, the newcomers see a steadily expanding row of high-rise buildings. Even as the destruction of many Syrian cities continues, construction continues in Tartous. A military checkpoint nearby stops people entering the city for as many as 40 minutes at a time to check credentials or search their cars. Above the checkpoint hangs a poster of Assad. The intensity of the search betrays something of the authorities' tension about preserving this stronghold. It's a strategically important spot, as Russia, one of Syria's few allies, maintains a naval base there. It's also politically important because the whole Syrian coastline remains supportive of Assad. Nizar Mahmood, a provincial official coordinating aid to refugees, say there's a reason for that. "The rebels have a hard time finding support here," Mahmood says, "[because] the coastal area has a higher proportion of educated people than other areas ... making them less likely to be deceived into accepting foreign money." Assad supporters here regularly blame outsiders for fueling the rebellion. They blame "the media," "the international media" or in some cases "the Jewish media" for creating the impression the rebels have legitimate grievances. There may, however, be a different reason Tartous remains quiet. The region is home to a heavy concentration of Muslims from the Alawite sect, the minority group to which Assad belongs. Sheik Ahmad Bilal, an Alawite religious leader, is a traditional adviser to the community on religious matters, just as his ancestors were. He says he worries about what would happen if the Assad regime should lose. There are fears of a bloodbath because many believe the rebels will open the borders to terrorists. Alawites were persecuted in generations past, but not recently. Bilal says Assad is not just a protector of Alawites, but of Syrians of all sects. He's doing this, he says, by improving the economy and spreading benefits, for example. Bilal rejects the idea of sectarian conflict, and points out that even in Tartous, Sunni Muslims, not Alawites, are believed to be in the majority. He dismisses the widespread belief that Alawites enjoy special privileges. The sheik says he was saddened when he heard of the recent massacre of Sunnis in a village in the region, and that he stayed home and mourned for three days. He insists, however, that terrorists were found in the village and brought destruction on it. Bilal has reason to reject thinking of this war as a sectarian fight, and that's partly because up to now it hasn't been. Political and business insiders of many sects have benefited under the Assad regime and still support him. If Syria's civil conflict truly did become a full-blown sectarian war, the Alawites would immediately be in danger of losing. There simply aren't enough of them.